Hon. 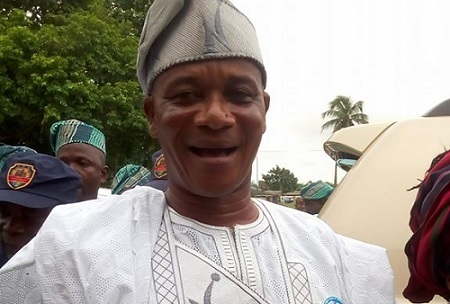 Adeniran Onilude, the Executive Chairman of Badagry Local Government has been picked by Mr. Jide Sanwo-Olu, the newly anointed aspirant to wrest power from the incumbent, Governor Akinwunmi Ambode after losing the support of the national leader of the All Progressives Congress, APC, Asiwaju Bola Ahmed Tinubu. Onilude was appointed as the head of Special Duties in Sanwo-Olu's campaign organization. Tinubu had reportedly remained adamant despite intervention by President Muhammadu Buhari and others on the need to soft-pedal on his decision on Ambode. In a statement by its Director-General, Mr. Tayo Ayinde yesterday, the Olusola Sanwo-Olu Campaign Organisation (BOSCO) said it “is on course. His formal declaration will happen shortly followed by his rally. The statement said Sanwo-Olu had inaugurated Directors and 3 Senatorial Coordinators for the campaign organisation with Mr. Tayo Ayinde as Director General. Below is the full list of his Campaign Organisation. Director General- Hon. Tayo Ayinde. 3. Fund raising - Tobi Lawal. 4. Legal - Hon. SOB Agunbiade. 5. Research and Intelligence- Hon. Wasiu Eshilokun. 6. NGO, Civil Society & Students- Hon. Kola Egunjobi. 8. Security - Hon Bolaji Ariyo. 10. Women Affairs - Hon Bolanle Akinyemi - Obe. 11. Ethnic Affairs- Hon. Wale Adelana. 12. Welfare - Hon Ayoola Fatai. 15. Medical and Safety - Dr Sulaimon Aleshinloye. 16. Volunteers' group- Hon. Kamal Olohrunoje. 18. Religion- Rev. Samuel Olufemi Ogedengbe. 2. Coordinator Lagos Central- Hon Wahab Alawiye King.